For whatever reason, some of the best conversations I’ve had with my children have been in the car. Or truck. Or whatever. Tonight Cooter and I were on the way home from Evening Prayer together, just the two of us, when he suddenly asked one of THOSE questions. You know, the ones where you gulp and feel yourself floundering for just the right words because you know, YOU KNOW, that he’s likely to remember your answer for a long, long time. As the seconds ticked by the best I could come up with–and this is not a new conversation for us–was to remind him that sometimes people are afraid of people who are different and how some folks with light skin thought they were better than people with darker skin and even, at one point, thought they could own these people. Once again, he was indignant over this injustice. Bless that heart. Out of the mouths of babes…..
How I wish I didn’t need to have these conversations with my child, but I’m so grateful he wants to have them. That he’s genuinely asking me what is right. I’m treading carefully here though. This is way more important than multiplication or grammar or learning how a bill becomes a law. So we talked about how the first thing you do when you know something is wrong is you stand up and say so. Stand up for what you believe is right. I know that feeling too, bud. So we talked about the best way to share our thoughts and feelings with other people. It was a good talk. Hard, because I didn’t know he felt like he had to do that when he was with his friends, but a good one. Good because he wanted to talk to me. My little guy and I shared some really important things on the ride home tonight. And it only takes us fifteen minutes to get home, y’all. And…..he’s back. My class clown. My self-proclaimed future comedian. Tonight I’m thankful for rides home in the dark when hearts are open and shared. I’m thankful for the one who talks, and that I can listen. I love the deep conversations and the silly songs. Because they are both very much a part of this journey we are on. And it takes both to make it beautiful. You Know You’re Loved When….. Yes. We are those people. We keep a hairbrush in the car. (Maybe even two) It has made me a better Mama to be honest. Instead of losing it as we are trying to head out the door and realizing I need to send someone (HER usually) back to brush their hair and wait THAT MUCH LONGER to pull out of the driveway, we just get in the car and she (or you know, whoever) can deal with it there. I looked in the rearview mirror and saw that she had actually already brushed it and pulled it into a side ponytail style of sorts. It looked brushed, and really, that’s all I’m aiming for. What could I say? I was busted. She was right. Our girl has never been a fan of having her hair brushed. So you can understand why I was VERY confused that my child was suddenly so concerned about the condition of her hair. I’m not sure where she acquired such information, and I do intend to ask her, only I keep forgetting in the busy-ness of our day to dailies, but I will. I mean, it’s not a bad thing to do, putting yourself together because you care. Still, I am curious as to where she might have come across information such as that…..the mind boggles. Tonight I’m thankful for my Aunt, the one our Princess loves enough to brush her hair for. (And y’all know that’s some for real, no kidding love.) I’m thankful for Cousins and laughter and dancing in the rain. For cups of coffee around a kitchen table and holding on to love and stories and the need to be together. I wouldn’t trade anything for my time with my people, and that I can have that, I am eternally grateful. May you all have someone so happy to be with you they’re willing to do just about anything to show it–even brushing their hair. Tonight I’m sitting with my Mama, as I remember her and struggle to fully grasp how long it has been since I heard her voice aloud. If we were able to honestly answer “Yes ma’am,” grace abounded. She was okay with almost anything as long as we had no kidding, no holds barred tried our very best. Mama was all about doing the best we could do in any given situation. It was something she taught us and expected. Some days that might still look pretty broken, but as long as we had “applied” ourselves (another turn of phrase she liked) and given it our “all,” Mama was pleased. It might follow that we would still have some work to do towards a resolution, but still. Our best was all she ever asked. Not THE best. Our best. Tonight I needed that grace. I’m thankful to Mama for reminding me of it. I can’t fix all the things I want to. I don’t have the time to make all the good things happen I’d like to make happen. I was grumpy a few times today and wish I hadn’t been. I didn’t get all the clothes folded that are on the couch. There are a couple of dishes in the sink that will likely stay there until morning. I cried twice today over things I can’t change. I forgot to thank my neighbor for driving me this evening. But I can say, pretty much, that overall, yes ma’am, I tried my best. And when I came to that realization, I felt a weight lift. (And I’m pretty sure I felt my Mama patting me on my back, but that’s another story.) As long as we can end a day by saying we’ve done the best we could do with what we had in front of us–well, then, I’m calling that a win, how about y’all? Love and grace to all. Note: As I was making this picture with the Latin words, I used an on-line translator, as it’s been just a few years since my last Latin class. To double check my translation, I reversed the process and learned the truest interpretation of the words here. The one that made my the most joy-filled, the most hopeful is the last one. Instead of saying “The redemption story is always possible,” it interpreted it to read, “The story is always redemption.” So much hope there. For all of us. Love to all. No. Right now, in this moment right here, they are THE MOST BEAUTIFUL WORDS EVER to hear from the mouth of another. Or from the keyboard of someone else. About a week ago I shared a meme on Facebook about how you know you’re a Mama if you keep running the same load of laundry for three days because you keep forgetting to move it to the dryer. I prefaced it with something like “I will neither confirm or deny. Ahem.” See? Even though I was saying THIS IS ME, THIS IS THE CRAZY I AM AND DO ON A REGULAR BASIS, I was leaving a little bit of doubt so maybe folks wouldn’t really know the CRAZY I am. It’s scary for me to share things like that. I like my mask. I like my doors and walls and staying put behind them. I joke about parading my crazy on the front porch, but other than some cobwebs that need sweeping up and some old Christmas greens that I should move to the fire pit pile, I really DON’T like to share my crazy that openly. Still, I shared it because on rough weeks (okay, and maybe not so much ONLY the rough weeks), I’ve been guilty of this. It struck a chord with me. It made me laugh. I had to share it. Because I get it and because as I’m easing closer to the big five-o, I’m hopeful that with that decade I will find grace to be all the CRAZY that I am and not be so guilt-filled or lost or overwhelmed by it. That’s what I’m hoping for. In the meantime, I’m leaking little bits of it here and there. 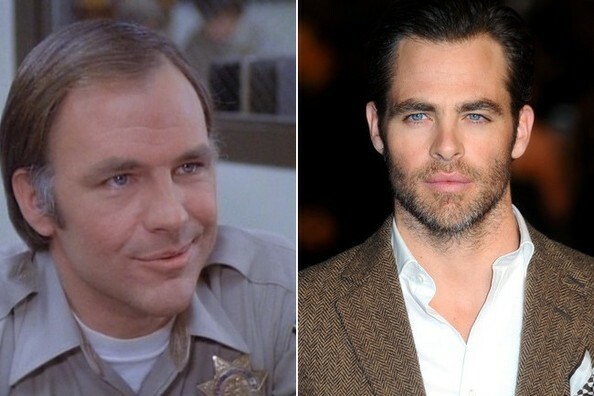 Last night I wrote about Robert Pine being Chris Pine’s father, and how that discovery amazed me. I figured I was the last person on the planet to learn of this, and everyone else would think–“Okay, Tara, old news. Move along.” But they didn’t. Folks said, “Me too.” And I didn’t feel quite so out of the loop. I’m rambling here. The thing I want you to take away from my true confessions here is that there is magic in the words “Me too.” Say them to someone. Listen to their story and when it resonates with you, when you find a kindred spirit, no matter how broken or crazy or silly the thing is, tell them. Let them know they are not alone. Tell them “me too” and watch their face change. Watch them smile or crumple in grateful tears. Let them know it’s not crazy to love the things they love or do the things they do or eat the things they eat. If you can own it, do. Tell them “Me too.” Shout it. (Well, okay, maybe not in every case, you don’t want to scare folks.) It’s good news to let someone know they aren’t alone. And some good news deserves to be loud and proud. Here’s my last point, and I hope you will take this one to heart as well. If something resonates with you, yes, say “Me too.” That’s beautiful and powerful and healing. But when it DOES NOT resonate with you, when you have no idea what it’s like or how someone can feel/think/believe that way, don’t turn your back on that person. Don’t walk away, don’t yell “Not me” or take off to tell everyone else about what you just heard. Maybe you can’t say “Me too,” but there’s something else that is just as magical. We don’t have to have all the things in common to be with another person. To be comforting. To lift them up. Sure the “me too” moments are wonderful and reassuring and really, really good. But so are the “I’m listening, tell me more” moments. The quiet moments of just sitting in the ditch with someone who is there simply because she loves you. She might not get it, but she loves you so she’s there. Being the oldest of four siblings in the dark ages before internet access, I got to make up a lot of stuff. Stuff that may or may not have been true. Stuff that the ones listening to me really couldn’t verify or denounce without going to Mama and Daddy. Yeah, there were days that I was that sibling. Summers get long and hot in Georgia, y’all. Without AC you kind of have to make your own fun. Mostly I would tell my sisters, especially Mess Cat, about celebrity relationships. I don’t know why it mattered, but on those hot summer afternoons when we tried to do as little as possible since sitting still you would still sweat puddles, it was Something. To. Do. It started with true stories. About who was married to whom, like Gil Gerard (Buck Rogers) and Connie Sellecca. Or who had been in what movie with whom way back when before they became famous. Then the imagination would take off and I’d be making up all kinds of stories. Inevitably, I’d cross a line–it always happened. That line that would cause Mess Cat to glance at me sideways and cut her eyes just so, squinting, thinking. I would hold my face still and just about hold my breath, hoping she wouldn’t see through my stories. But she did. Some days it took longer than others, but she always did. Sometimes I’d continue to feign innocence for days, but eventually she found me out. Oh the fun of the good ol’ days. So it was that yesterday after the ball game (I watched that whole fourth quarter of the Seahawks/Panthers game–I’m a fourth quarter kind of girl, but that’s a story for another night), the TV was still on, and I was focused on what I had been working on. I think I was crocheting another stripe on my temperature blanket. Whatever it was, my attention was not on what was on TV until I stood up to turn it off and leave the room. It was then that I saw two men on the screen with the same last name. It actually fell open. I was frozen in place for a moment. WORLDS COLLIDED. Growing up we did watch CHIPS. My favorite was not Erik Estrada’s “Ponch” character or Jon Baker, though they both were entertaining enough. My favorite was Robert Pine’s character. For whatever reason, I just really liked him best. When I looked up at the screen yesterday, Robert Pine was pictured there. But it was the young man next to him that made my mouth drop. I have loved him since his Princess Diaries 2 days. That’s one of my go to movies. Yes. If it’s on, I’m watching it. As a matter of fact, it came on one of the channels the other day, and Aub said, “Mama, it’s like they know you.” And we all sat here and watched it. Again. And so you might can understand how surprised I was when it all clicked and I realized that Robert Pine is Chris Pine’s father. Of course he is. I can see the resemblance now. For a moment though, I looked around to see if my sister Mess Cat was anywhere around. She would have loved the poetic justice in that moment, I’m sure. It’s fascinating when life surprises me with new stories, new things I didn’t know, things I never even considered before. Even when it’s trivial things like who’s related to whom in the acting world. Tonight I’m thankful for all the happy and lazy memories that yesterday’s discovery brought back for me. We worked hard, played hard, and lazed around hard all those summers so many years ago. And we laughed and loved hard. That’s what brings me the greatest joy.